I never would have imagined chickens at a school. Granted, it was in a rustic location, but in my mind chickens are found on farms, not at centers for education. Still, there I was with the nonprofit I work for, sitting at a rural black high school in South Africa listening to a small band of mismatched children singing in their native Zulu. I could see chickens clucking and scratching in the yard behind them and smell freshly upturned soil from the fruit trees we had just planted, a small gift of hope. This is my life. Flash back seven years. Arriving at Allegheny College, I had many areas of interest, and like most teenagers starting college, no idea what I wanted to do. I played the saxophone, was active in church, and was completely obsessed with birds, so I focused on all my interests, majoring in religious studies with a double minor in biology and music. When I graduated in 2002, I was confronted with mixed emotions. I was proud of my accomplishments, but I also had the sickening feeling of “What now?” The years at Allegheny had solidified my many desires, and instead of having one stand out as the beacon to a clear future, my interests were as diversified as ever. I loved every bit of the variety and challenge that Allegheny offered, but after leaving I was still faced with the daunting task of choosing one direction from the many different avenues I explored. I had never seen passion as a problem, but how does one choose between many loves? Over recent years, I have slowly learned this wonderful lesson: You don’t have to choose. Since graduating I have studied as a worship leader. 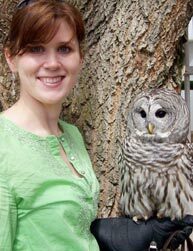 I lived in Salt Lake City working at an aviary as a bird trainer and educator, performing outreach programs and bird shows. The biology part of my degree helped me land that job. Last year I saw an opportunity to visit an old friend, St John Haw, a South African student who did his semester abroad at Allegheny. While in South Africa I came across a bird job and, in what sometimes seems like a bout of insanity, moved to Africa. The job didn’t work out, but I am still living in South Africa working for St John’s nonprofit Fruit for Thought, planting fruit trees in underprivileged schools to supplement the students’ nutrition. I am even teaching saxophone lessons on the side. My life has been more interesting than most, and I could say it was luck or fate that provided me with all these amazing opportunities. Smart education played a larger role. Just by being what it is, Allegheny prepared me for all of the different prospects that have come along my path. I am wired to think openly, to think more diversely, and be confident in numerous situations. So many students are just like me, a person of too many interests to choose just one. My best friend, Melissa McCrimmon ’03, is a perfect example. She majored in history, double minored in music and Russian, and had a passion for cinematography that she developed on the side. Melissa has studied in Moscow, worked for PBS, and is now working for the Houston Symphony. I think Allegheny provided her that perfect little niche to develop multiple interests and embrace them, and to be open to new ideas that come along. So, hats off to those of us who love the unique dynamic our wonderful little college provided. I for one am going to continue down the path of the unknown and see what doors open. My South African visa is good until December of 2008, and I have no idea what is to follow. But am I worried? Not with Allegheny behind me.